NY Party Works has the party rentals and services you need to add flair to your event. We are fully insured and permitted throughout Long Island, New York, and New Jersey as well as other parts of the country as well. We’re the area’s premier party and event company and we’ve been in business since 1993. We’ve been helping clients organize fairs for decades and we want to tell you how we can help make your street fair sizzle. Perhaps the most popular theme for a street fair is a carnival and NY Party Works are the Carnival planning experts. We can give you the basics like our traditional Carnival Booths which are suitable for a variety of needs. We also offer tent, table & chair rentals. The red and white striped booths can be used for games, as a food stand, as a ticket booth and more. We can also offer you games like our inflatable Whack A Mole, or our Carnival 3 in 1, which allows you to have a venue for three different toss games at once, or our Carnival classic the High Striker which lets you show off your strength with a mallet. We also have the more economical Mini Striker. NY Party Works has rides such as our popular Tubs of Fun which is great for all ages. We also have kiddie rides like our Li’l Swing Ride. Some of the most popular attractions at autumn street fairs are our inflatables such as bouncers and slides. Some of our most popular ones are our 20 X 20 Bouncers including our 20 X 20 Castle which has windows so parents can monitor their children. We also have spectacular slides, from our spectacular 24-foot Patriotic Double Lane Slide to our 22 foot BMX slide. NY Party Works also provides entertainment for street fairs. We can provide face painting, temporary tattoos for guests of all ages. We offer temporary airbrushed tattoos, henna tattoos and body art in all types of designs. We also offer entertainers like circus performers, fortune tellers and magicians. And what would a street fair be without food? NY Party Works can bring some traditional favorites to your event. From hot dog carts to popcorn machines, we have it all. We can give you nachos and we also have both cotton candy machines and carts to satisfy the sweet tooth. Why stop having fun just because summer is ending? 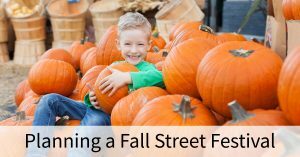 NY Party Works can help you plan the perfect fall street festival and give you everything you need. All you have to do is get ready to have fun! Contact us today.